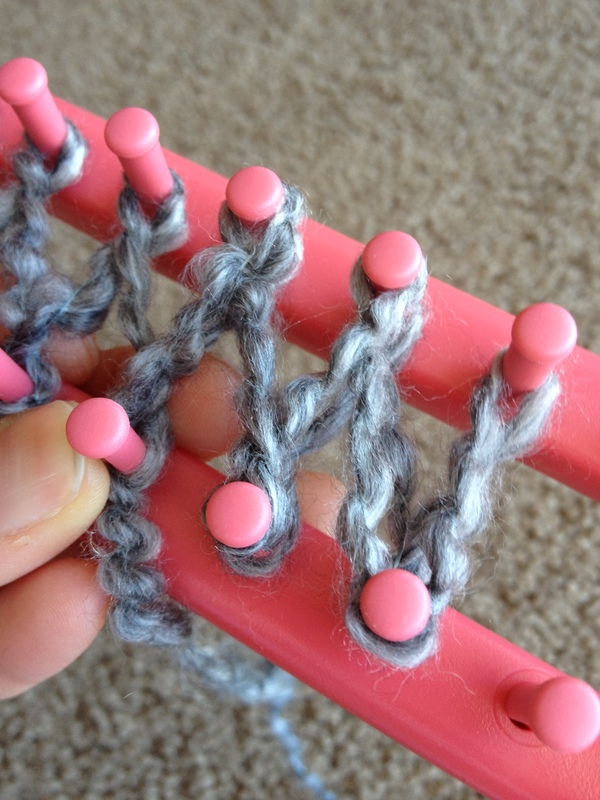 Loom knitting is really easy and much quicker than regular knitting. 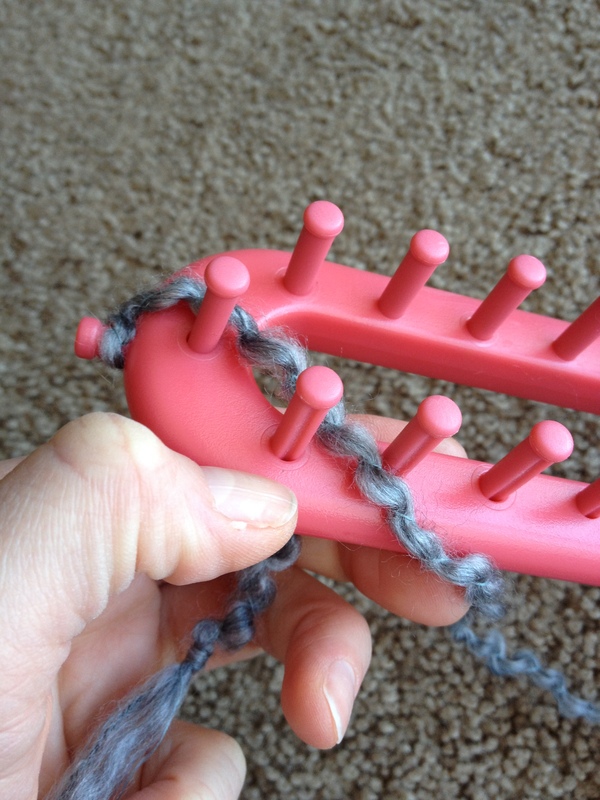 I have been arm knitting a lot lately but I decided to use my leftover yarn to try out this loom knitting kit that my mother-in-law bought me a while back. The knit included a rectangular loom, a needle, and a hook plus instructions with illustrations (I appreciate those). 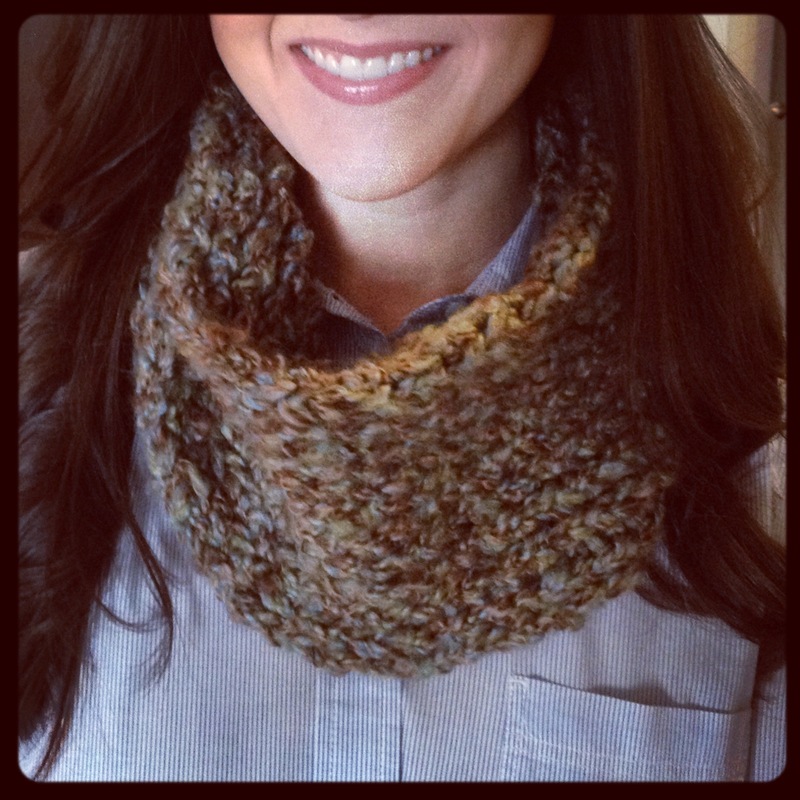 It was so easy to get started and it only took about 5 hours to complete a wide, thick infinity scarf and about 6 to complete a thin, long, triple loop infinity scarf. 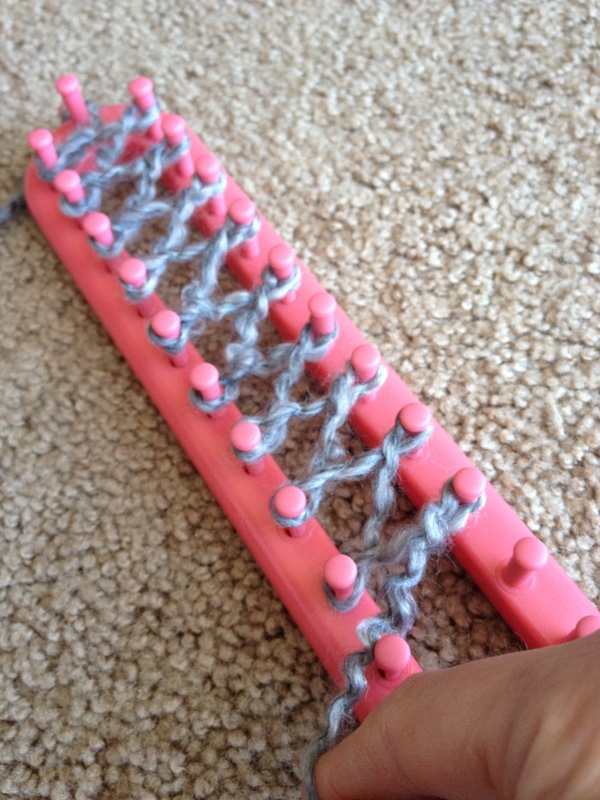 This loom included instructions for three different methods, single knit, double knit (what I did), and circular knit. The double knit will be nice because unlike some of my arm knit scarves this scarf is much more dense (less space between knits). 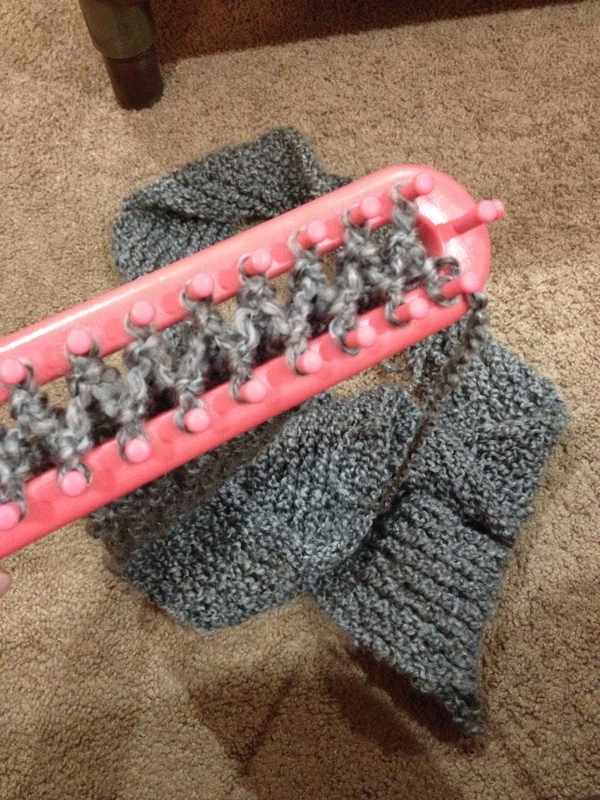 Below are steps for a double knit scarf. 1. From the ball of yarn, allow a few inches for your tail and wrap or make a slip not around the end peg (on either side of the loom). 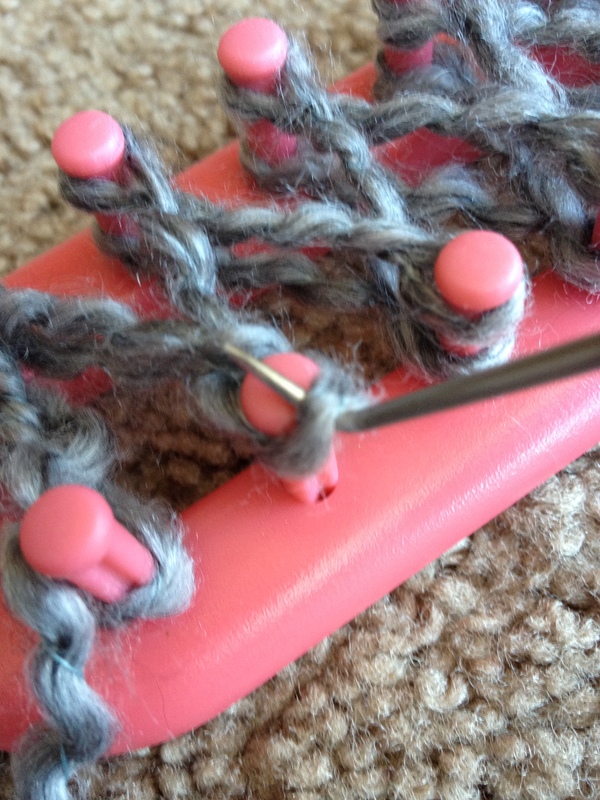 Then place the yarn across to peg number 1. 2. At peg number 1, wrap the yarn around peg number 1 clockwise and move the yarn to peg number 2 across from peg number one. 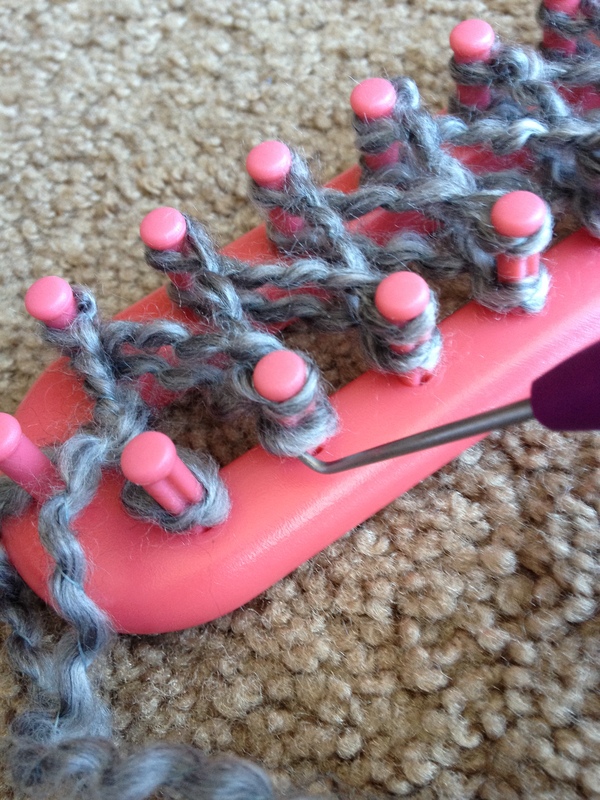 Then wrap peg number 2 counter clockwise and move the yarn to peg number 3. 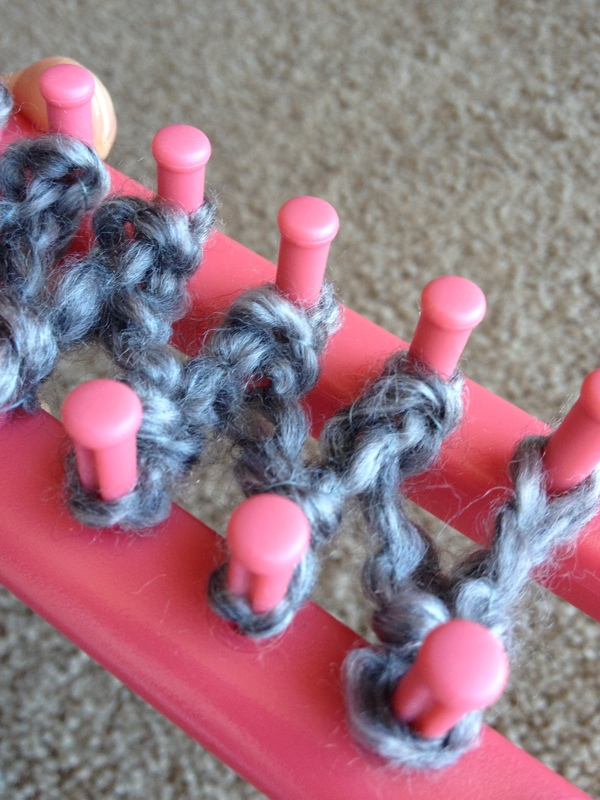 Continue this process of wrapping the pegs in a figure 8 pattern, depending on the length of your loom and the width you want your object (in this case a scarf). For my first scarf (wide and one loop) I used the whole loom (12 pegs) for my second scarf (less wide, three loops) I used 9 pegs. 3. 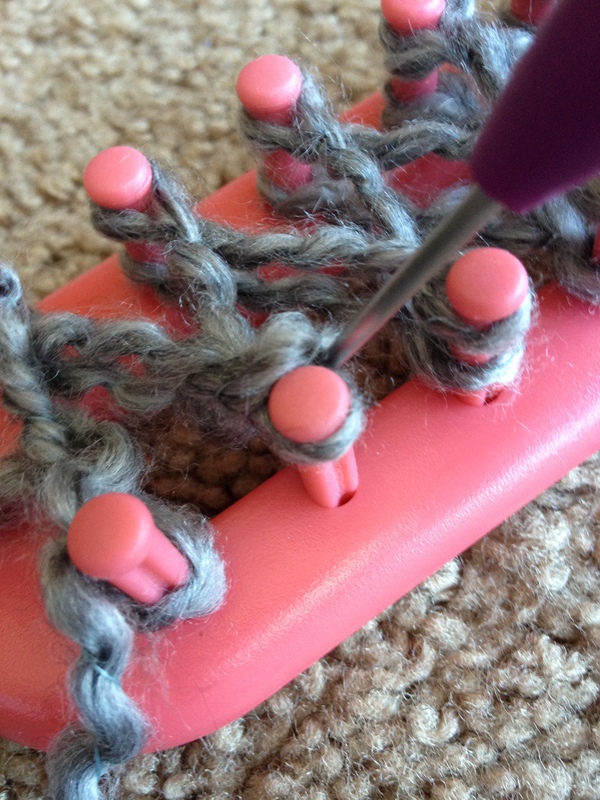 Once you get to the last even numbered peg you are using, bring the yarn across and hold tightly so the loops do not come out of their figure 8 positions. 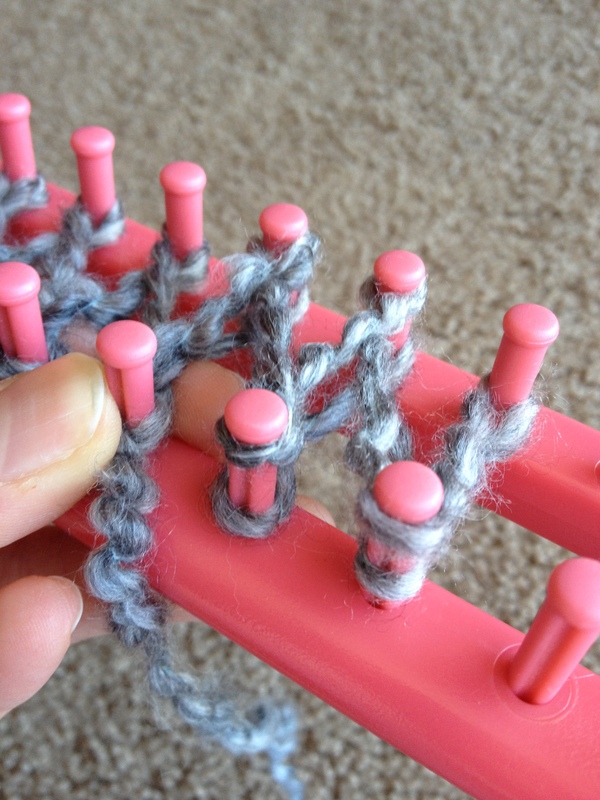 With your other hand, push the loops down on the pegs toward the base of the loom because you are about to loop back over. 4. 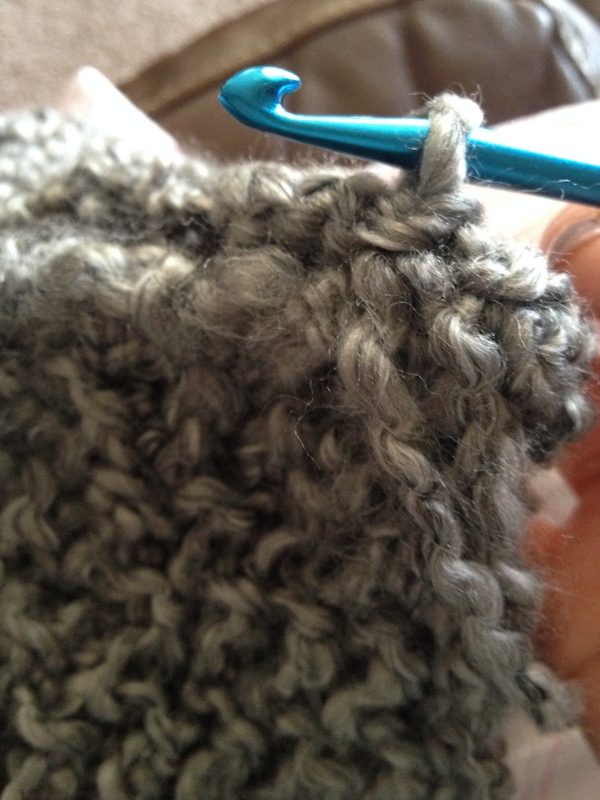 Now start wrapping the yarn back in the direction you just came (toward the tail which is wrapped on the end peg). So now take the yarn you brought across from the last wrapped even numbered peg and wrap it counter clockwise around the odd number peg and pull it over to the next to last even numbered peg and wrap it clockwise. Then continue your figure 8 pattern all the way down. Your last even numbered peg will not have a second loop. 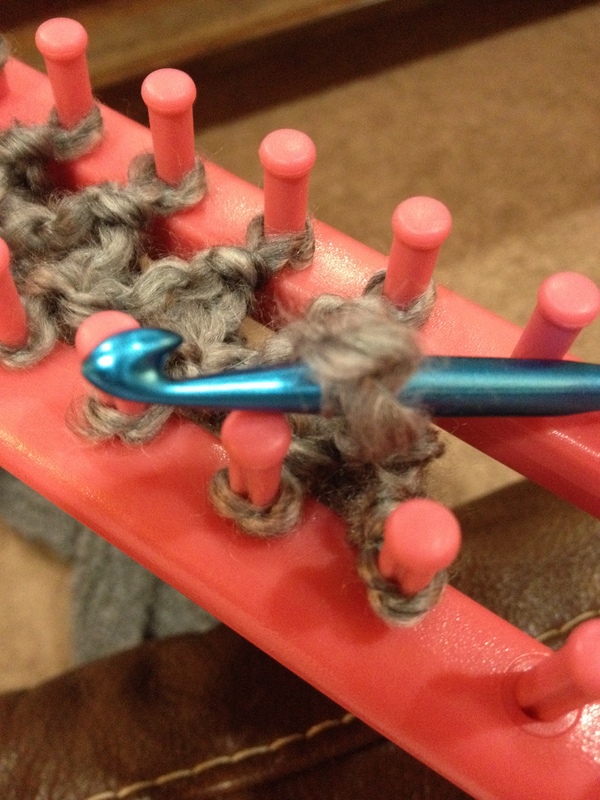 Once you get to your last peg pull the yarn across to the other side and hold tightly so the figure 8’s don’t come loose. 5. 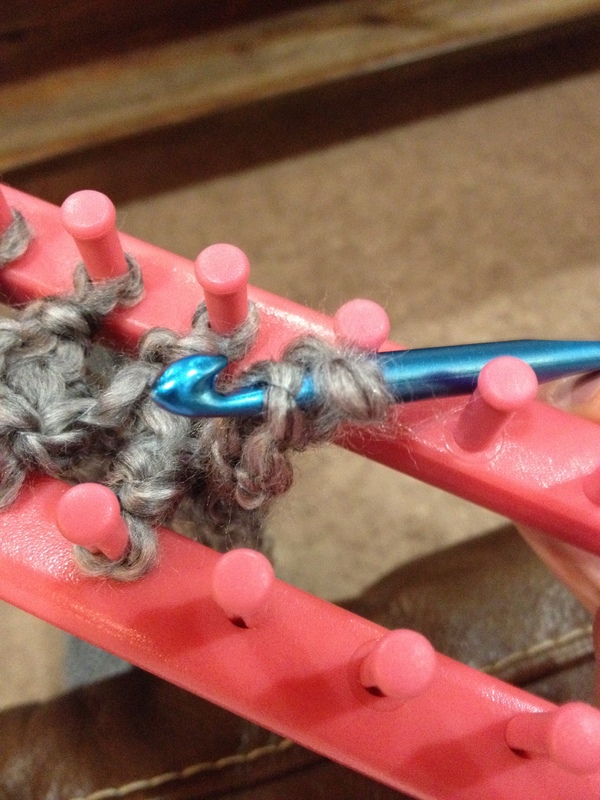 Your loom probably came with a loom hook. Use it to grab the loop underneath the top loop and place it over the top look. 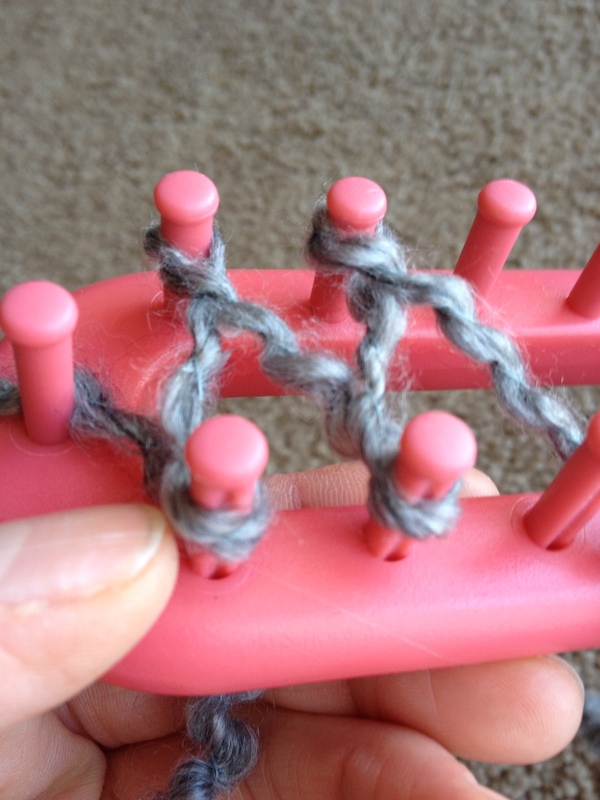 I did this first to the peg with the loose yarn in order to secure my loops and then I went down the row grabbing the bottom loop and placing over the top loop. Once you are done, you will start the process all over again, wrapping in the figure out pattern. 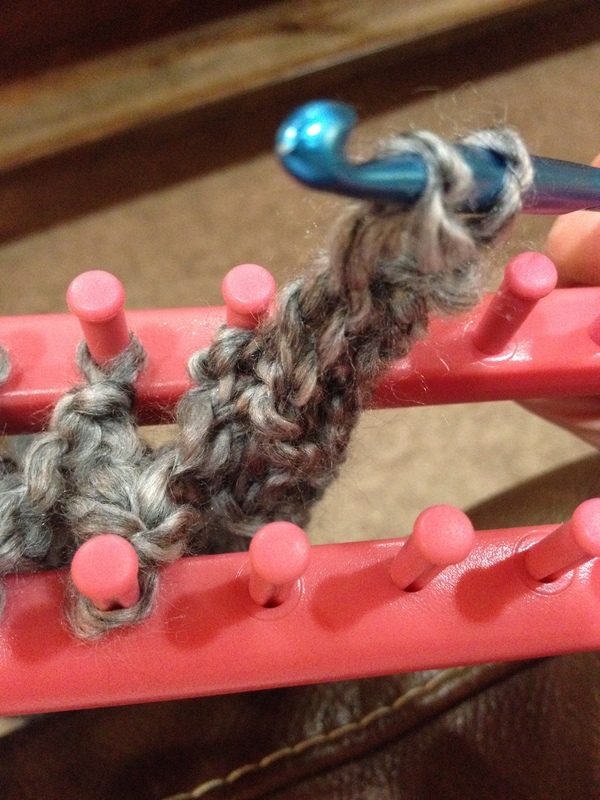 Each time I flipped my loom over so I could use my right hand to wrap the yarn. 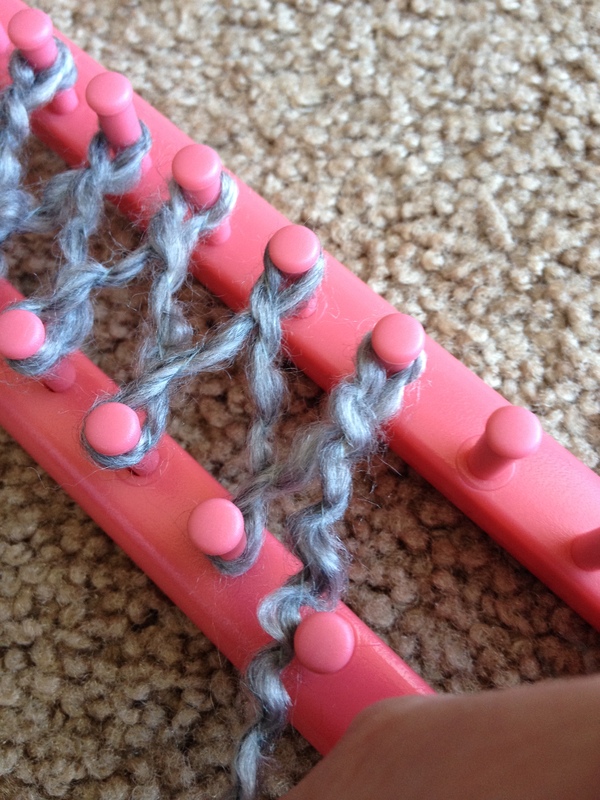 As you put the bottom loop over the top loop you can simultaneously push the new bottom loop down toward the base of the loom to make room for the new set of loops. 6. 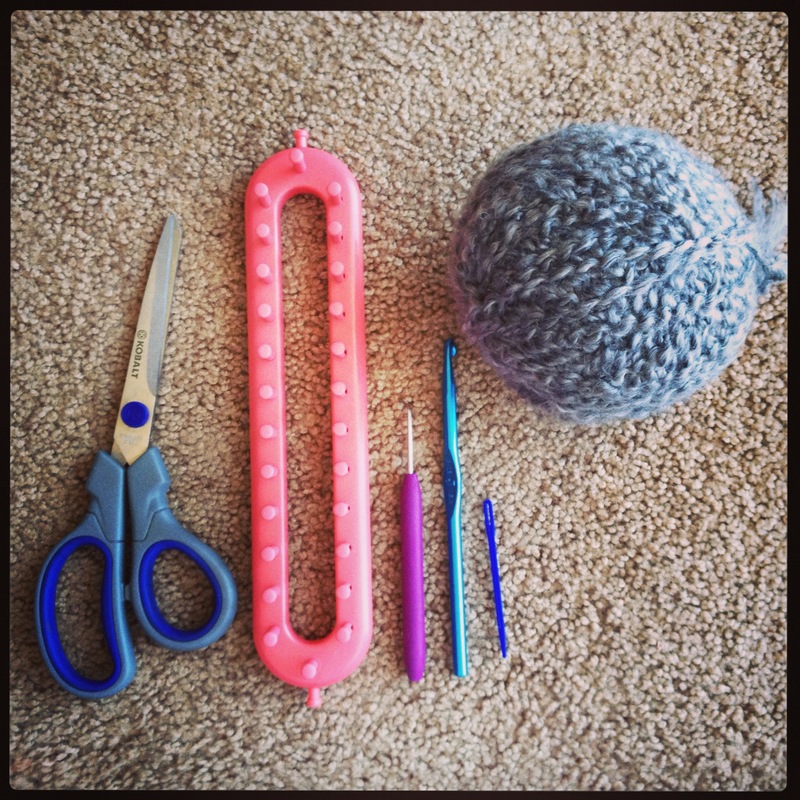 Until your scarf reaches your preferred length, continue this process. After a few rows you will be able to undo your tail from the end peg and let it hang below the loom with the rest of the completed knits. 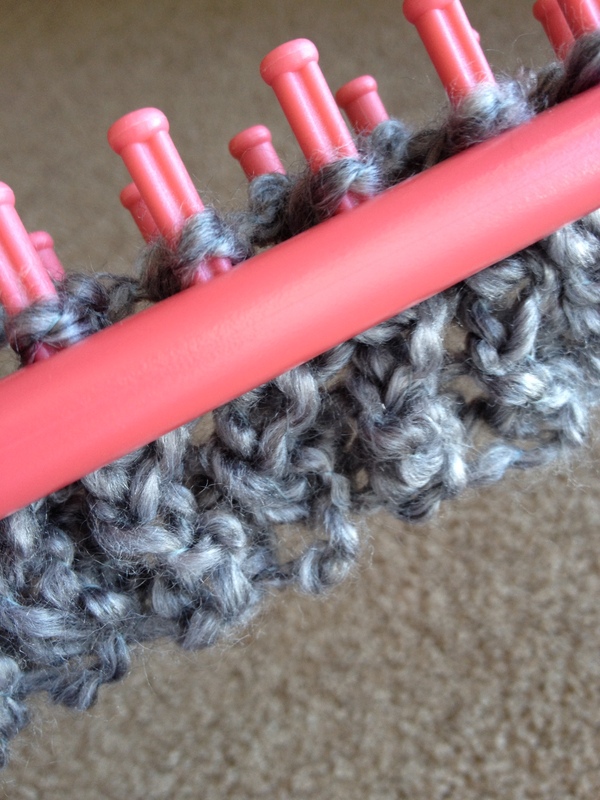 7.Once your scarf is at your desired length and there is only one loop around each peg, cut your working yarn leaving enough to braid back into your scarf or combine your two ends if you are making an infinity scarf. 8. 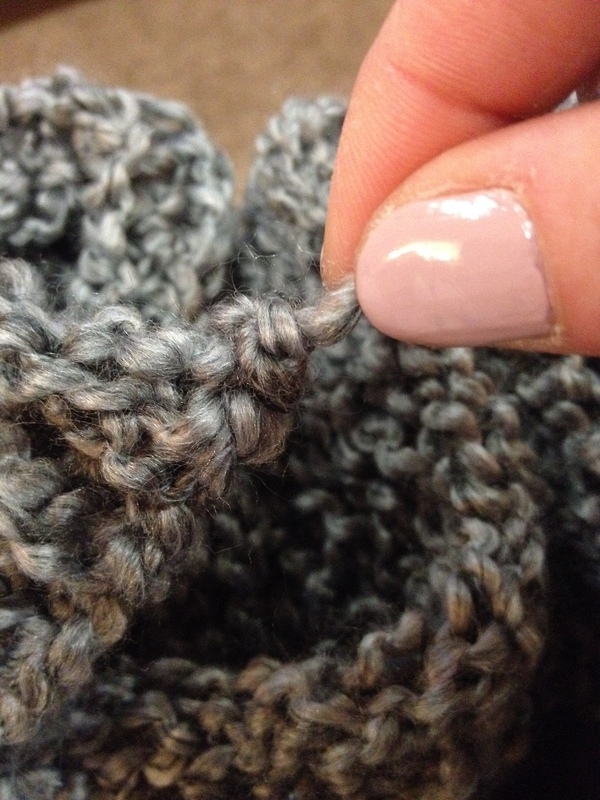 To bind off your end, start at the end opposite of your tail and use a crochet hook to lift the loop off the odd numbered peg onto the crochet hook. 9. Go to the even numbered peg across and lift that loop off onto the loom hook and pull the first loop you lifted over the second loop you lifted. Do this all the way down the loom. 10. 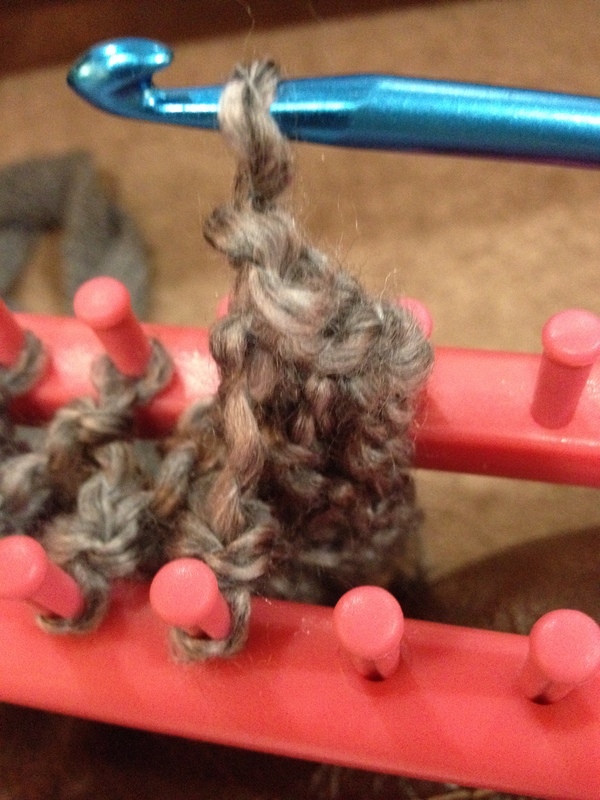 For the last loop I pulled the working yarn through and made a small secure knot. 12. Pull the tail through the loop. 13. 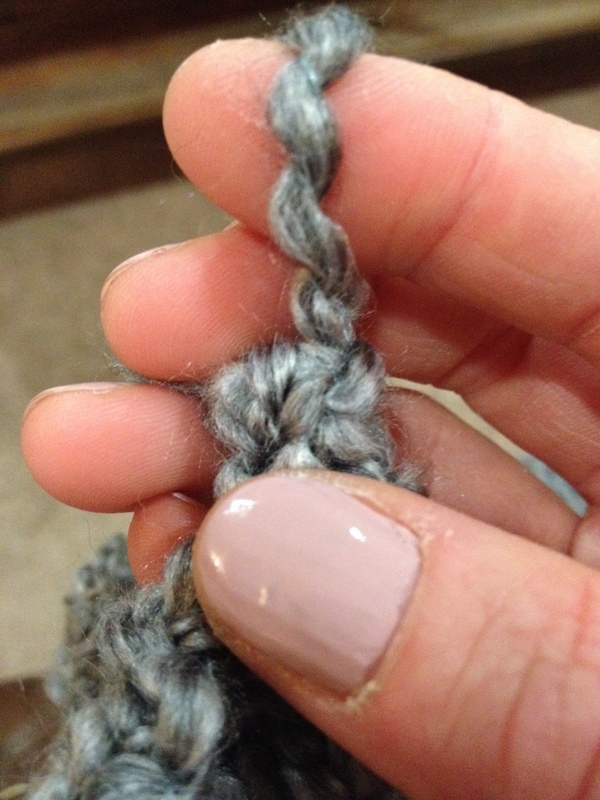 Twist the loop and tie a knot with the tail. 14. Now your two ends are secured. 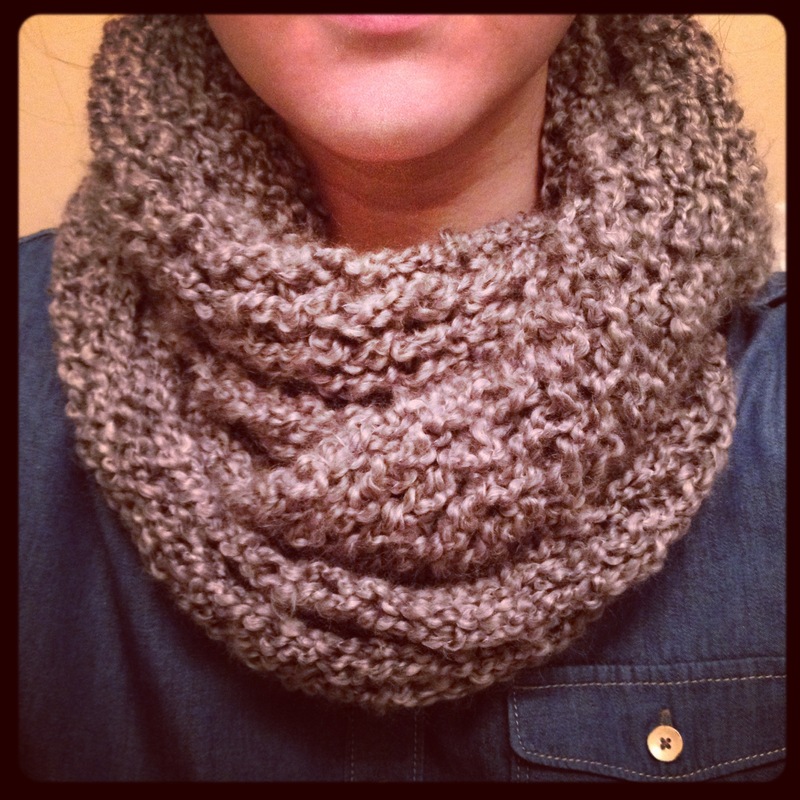 You can braid your ends back into your scarf for a long scarf or you can bind the ends together to make an infinity scarf. 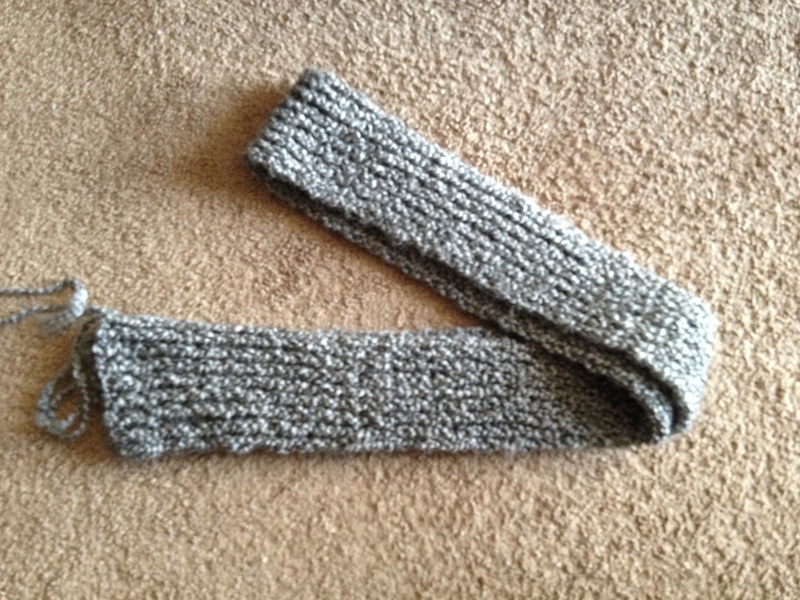 Because this scarf was narrow I made it long enough to wrap around three times. 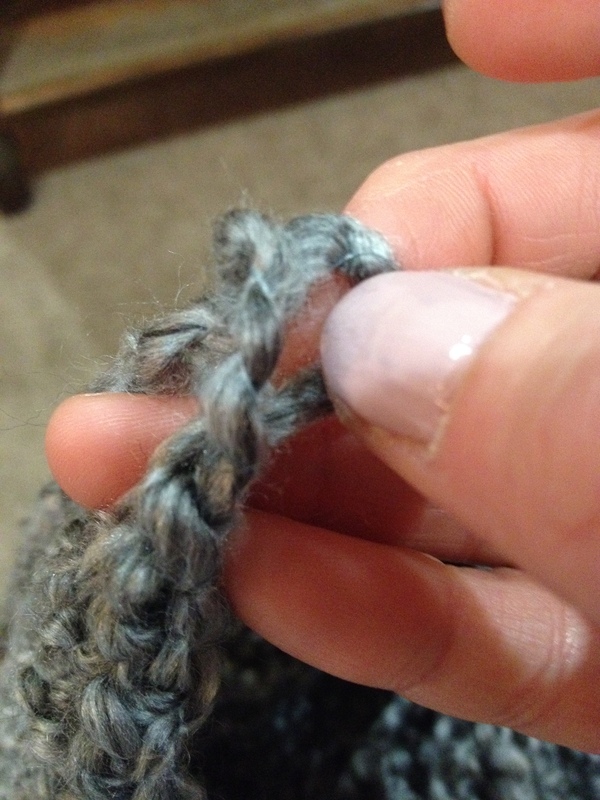 To braid the two ends together, start by folding the scarf over on top of itself. For the scarf below (one loop) I twisted the scarf once before combining the ends. 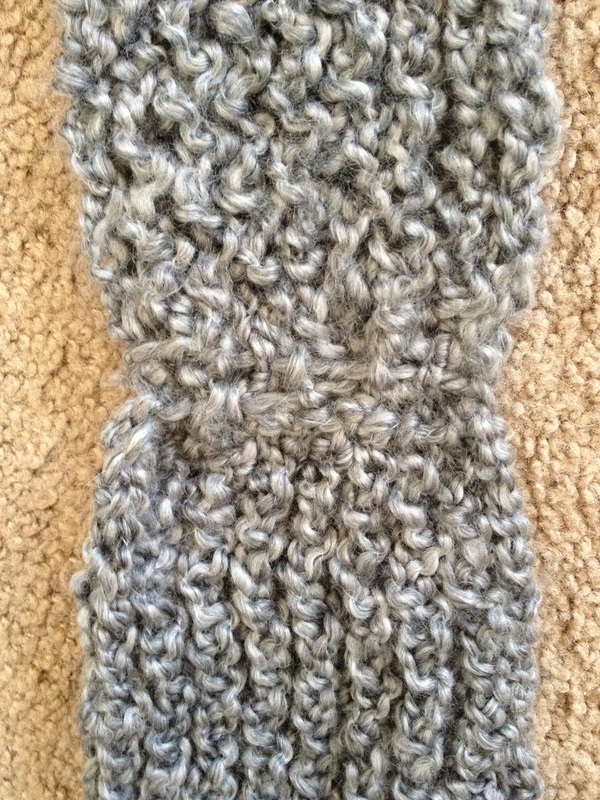 For the scarf above (three loops) I did not put a twist in before combining. If you did not leave enough yarn to do this you can just braid your working yarn into your scarf and use an additional piece of yarn from your skien to bind the two ends together. 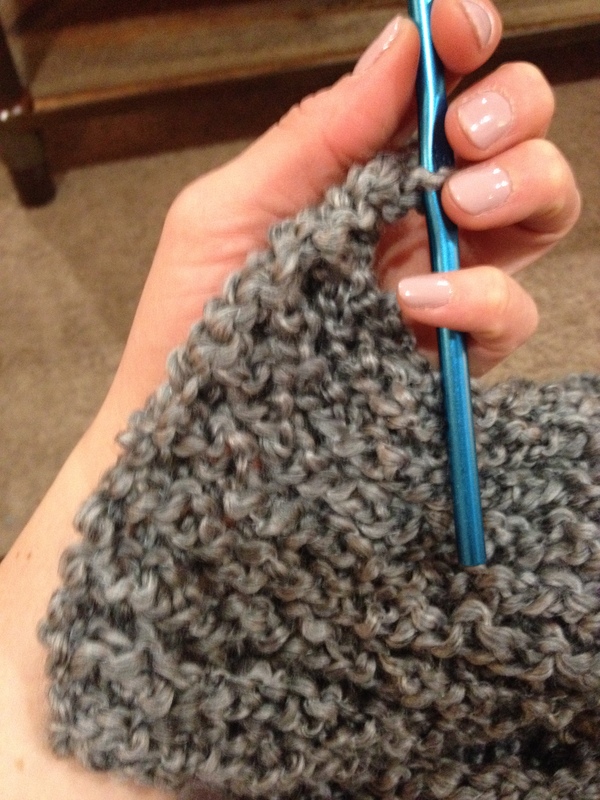 Take your crochet needle and weave the working yarn into each end of the scarf back and forth from one side to the other.